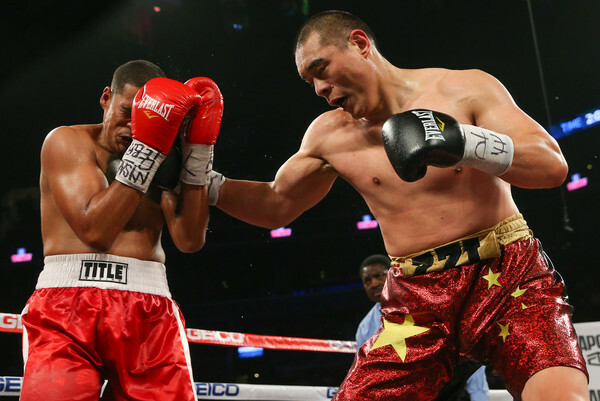 If unified world heavyweight champion Anthony Joshua wants to expand his global reach he should face his old amateur rival Zhilei ‘Big Bang’ Zhang, according to the US-based Chinese boxer. Zhang lost on points to Joshua by scores of 15-11 in the quarterfinals of the London 2012 Olympic Games where the British boxer went on to win the gold medal in the super heavyweight division. The 35-year-old southpaw in unbeaten in 19 starts including 15 via the short route with 11 first round stoppages. The WBO rates him the sixth best boxer in the heavyweight division. In an interview with Sky Sports Zhang says he believes a fight with ‘AJ’ would help the reigning IBF, WBA and WBO heavyweight champion to unlock two new markets while growing his global popularity. “China has a top market and great business opportunities,” said Zhang, who is based in New York City but still occasionally fight back in China. “He always fights in the UK. If he doesn’t want to take the chance and fight in China, we should fight in the US. “Chinese fans are starting to follow professional boxing a lot, plus China has great atmosphere for boxing. Two years ago Barry Hearn of Matchroom Sport flagged the idea of taking Joshua to China to fight. “We’re two years away from saying we can sell out the Bird’s Nest in China,” said Hearn in May 2016. “I think Joshua’s going to be a global figure, and therefore I’ve got to give him a global platform. Zhang, who won silver at the Beijing Olympics in 2008, insists he is ready to take on a boxer of Joshua’s calibre. “I’m ready to step up and fight the best fighters out there. I’m just waiting for my promoter to negotiate and work together internally to approach that goal,” said Zhang.